Enjoy spring like, cleaner water from every tap in your home by filtering out chlorine, chloramines and other contaminants. 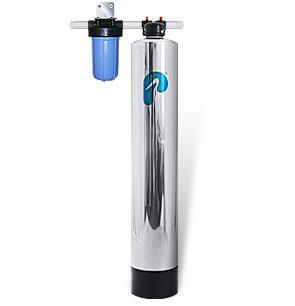 With our whole house water filter system you will enjoy softer hair and skin without the drying effects of chemicals. Consequently, you will savour the differences in your cooking, coffee and tea with tastier filtered water. The Pelican Carbon Series Whole House Filter uses a 4-stage filtration process to remove sediment, filter chemicals and contaminants, and prevent bacterial growth. In fact, our UV system destroys 99.9% of microorganisms to safeguard against boil water alerts without affecting the taste or odor of water. 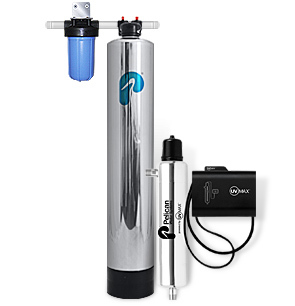 The Pelican Carbon Series Whole House Water Filter implements a 4-stage process to filter out sediment, chemicals and contaminants, and stop bacterial from growing. Furthermore, our UV system destroys 99.9% of microorganisms to protect you. You will no longer need to worry about boil water alerts, or the taste of chlorine and other chemicals in your water. Our UV system destroys 99.9% of microorganisms to protect you. As a result, you will no longer need to worry about boil water alerts, or the taste of chlorine and other chemicals in your water. Since all water entering your house will be free of many contaminants the life expectancy of water-using appliances such as hot water tanks, washing machines, dishwashers, and coffeepots, will be increased. Equip your home with Pelican Water’s whole house water filter system and rest assured that all the water in your home is cleaner and safer, no matter if it comes from the kitchen sink, shower, or sprinklers in your yard.